Shawna picked up the paperweight from her bosses desk and examined it more closely. 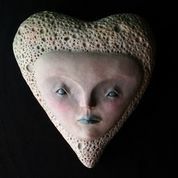 It was a gray stone heart no bigger than the palm of her hand with a beautiful face etched into it. She could tell that someone had taken their time and created the peace out of love. The face was so realistic. The eyes looked as if they were looking through your soul and the set of the rest of the face looked as if someone had deeply disappointed it. She started to rub her finger down the bridge of the nose and dropped it when the nose seemed to twitch at her. “Oh crap.” She said loudly bending to retrieve the piece of art from where it’d dropped under the desk on the hardwood floor. She prayed that it wasn’t broken and had just managed to grab it from under the desk when she heard someone clear their throat behind her. Jumping up from her space on the floor she stuck the paperweight in her back pocket and adjusted her pants. “Can I help you with something?” Lucas asked walking towards her and stopping just close enough to invade her space. “I’m sorry I came in to give you this message and dropped my pen under your desk.” She answered passing him the piece of paper from his desk. He took it and stood there looking at her hands questioningly. She felt her face redden as she realized as he had that her pen was on his desk. She grabbed it and murmured “I swore it rolled under the desk. Sometimes I’m so blind.” before rushing out of his office straight in to the nearest bathroom then locking the door behind her. “Why did you take me?” a muffled voice said from inside her back pocket and she nearly jumped out of her skin. Thinking that she was imagining things she reached into her pocket and pulled the heart out. “Thank goodness you took me out of there. Your trousers are way too tight.” The voice said angrily. She wanted to throw the thing in the trash she was so freaked out. She sat down on the toilet holding the thing up to her face so she could examine it more closely. “Am I crazy or do you really talk?” she questioned. “The answer to your question is both. Now take me back to where you found me right now.” The face said glowering at her. “How is this possible?” Shawna said more to herself refusing to believe that the object was talking to her. “Do you really wanna know? Put me close to your ear.” The voice said quietly. Shawna lay on the cool bathroom floor wondering how she could ever get her body back. Her mother had always told her that curiosity killed the cat and while she wasn’t dead she figured she may as well be as she was doomed to spend eternity staring through the eyes of a cold heart.